This is my first Thanksgiving without my mother. I feel the quote below from Dr. Seuss says it all! Since today is Thanksgiving, this seems to be a good time to make a commitment to cooking her recipes and ultimately compiling them into a cookbook for her family. I have chosen a sweet potato dish, which we always referred to at Thanksgiving as a Sweet Potato Souffle’. It was a staple of our Thanksgiving meal for as long as I can remember. However, I’m not sure why it was called a souffle’, because it doesn’t remotely resemble the definition of a souffle’ below. In fact, the recipe is so old, the word souffle’ has been scratched out and replaced with the word “dish”. This was a staple for many years during the holidays and it never failed to please! But, the recipe itself changed over the years – for instance, 1 1/2 cups of sugar has dwindled to 3/4 cup of sugar – I can’t imagine how sweet this would have been with that much sugar in it. The dish itself is only 7 ingredients, It is a pretty simple recipe, but a very tasty dish. You can download the recipe HERE. 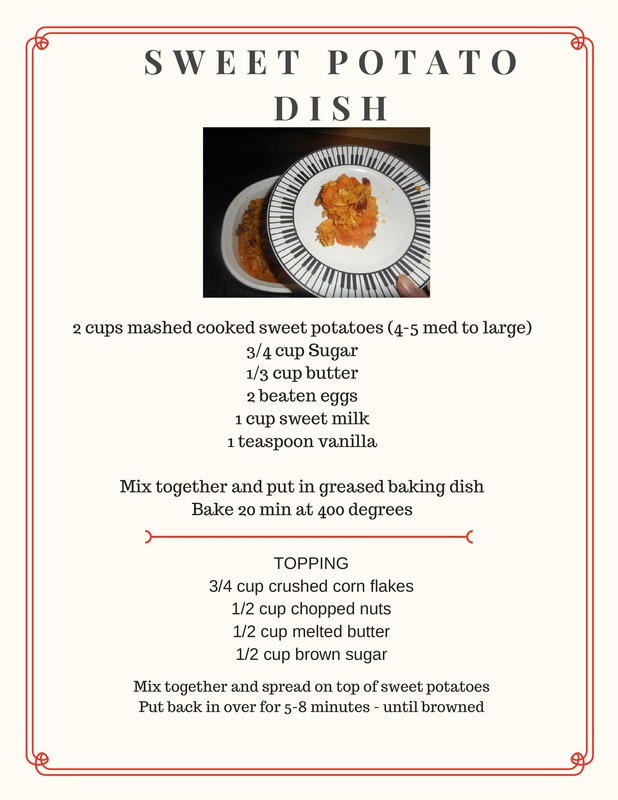 This entry was posted in alzheimers, Mom's Recipes, VICKIE MARTIN ART and tagged mom's recipes, Sweet potato recipe on November 23, 2017 by vickiemartin.